At the turn of the (last) century, a Victorian Englishman, Phileas Fogg (David Niven), makes a bet with his gentleman's club (the London Reform Club) friends: with steamships and hot-air balloons and railways he can circumnavigate the world in 80 days. He wins the bet of course, but not after many close calls. 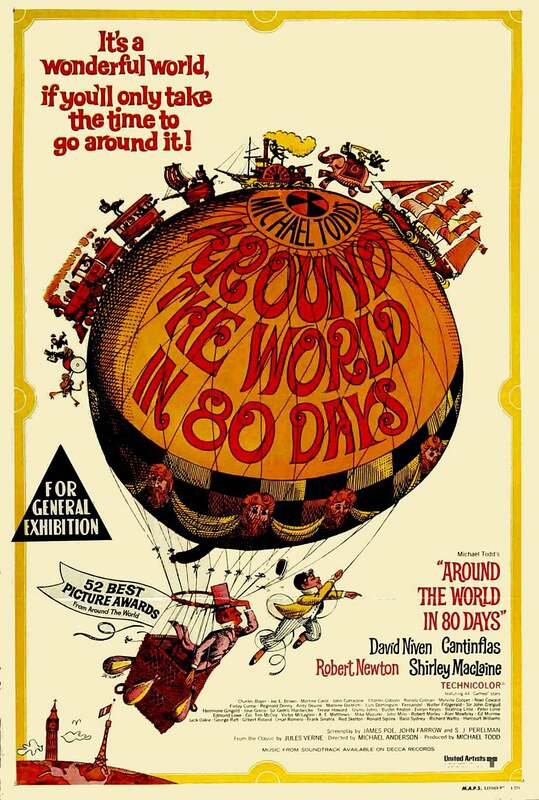 Around the World in 80 Days conquered everyone around the world and went on to win Best Film – Drama, at the Golden Globes. Its director, Michael Anderson, was nominated (however Elia Kazan won for Baby Doll), and Mexican comedian Cantinflas (born Mario Moreno) won, oddly, as Best Actor in the Comedy category. It was the first and last time in the Globe history that an actor won in the opposite category than the film he/she starred in. Kirk Douglas won as Best Actor – Drama, as Van Gogh in Lust For Life.